House Speaker Nancy Pelosi talks about politics, sexism, impeachment, Obama, and her own personal VP pick. I met with Pelosi in her House chambers a week before publication of her new book, co-written with Amy Hill Hearth, Know Your Power: A Message to America’s Daughters. The book is more inspirational manual than cold-eyed guide to the tough battles Pelosi has waged these last years against a President whom she’s called “a total failure.” While it’s clearly designed to humanize Pelosi–a onetime stay-at-home mom of five, now grandmother of seven– the book also serves as a vehicle for the Speaker to hit the interview circuit, as she will this week, to talk about the state of the country, the Democratic Party, women and politics, and the presidential and Congressional elections. What follows is an edited transcript of my conversation with Speaker Pelosi. In the course of a forty-five-minute session–with the Speaker’s press secretary Brendan Daly joining us–Pelosi touched on sexism in the media, Al Gore’s visionary speech, her pick for Vice President, Hillary Clinton, Barack Obama and how she balances effective governance and politics with pleasing the progressive base and staying true to her own values. He’s absolutely right. They ask me, do you accept the challenge? What he is describing is absolutely possible. While some people think it will take a little longer that doesn’t mean that he’s not on the right path. It’s all a decision, all of it is a decision. The country made a decision to set a renewable electricity standard. We had it on the bill last year, died in the Senate. But we will bring it up again. The renewable electricity standard which says that x percentage of our electricity must be generated by renewables. And in order to accommodate some people we said “and efficiencies” so that they got credit for efficiency. Gore’s plan is more ambitious than what we could pass here, but now with his putting it out there, it’s possible, it’s urgent to do so and frankly that urgency says unless we do so, well it’s really a much longer road back. So what he says is music to my ears; he’s educated us all well over time. Isn’t he great?! This is the thing–the idea of a new economy Al Gore says it very well but Van just takes it home. And he does that footwork and the beauty of it is that all these new technologies–the new jobs, the green jobs–everybody’s on the ground floor–inner city neighborhoods, rural America…what are we going to do to create good paying jobs in America when they don’t even reward productivity and when our productivity increases they don’t reward it? We have to have a different economic, a progressive economic agenda that includes the new the greening of America, the building of infrastructure. One of the perils of my job–not perils but occupational hazards–is that you don’t have as much time to reflect as you would like or make submissions to challenges facing the world, so to analyze what has happened in a campaign is really a luxury. The fact is, of course, there is sexism. The question is what do you do about it? There has to be a recognition of it. You have to inoculate against it with your own truths and say this is what you get, don’t trivialize this, don’t make fun of that. But you have to recognize it as there. Did it cause Hillary Clinton’s defeat? I don’t think so. I think the victory was there, perhaps a different approach to the primaries and caucuses and the recognition that it’s a long process and be ready for the whole thing. You know what those political decisions were. I do not have the statistical information to say but for the sexism she would be the nominee. I don’t think so. I think that may have been an element but there were other campaign decisions that were not a furtherance of her winning the nomination. Did she advance women? Magnificently. She was so brilliant, so articulate, she had so much stamina. This is not an easy thing–and as I say that running for Congress, multiply that to the nth degree–this is not for the faint of heart. You go into that arena; it’s a tough place to go. Believe me. And she handled it with grace and beauty and intelligence and the rest. I thought she was fabulous and the cause of women was enormously advanced by her grace. Once you have the gavel that diminishes it greatly. If they’re smart! And mostly they are smart. It’s amazing what a difference a gavel makes! Every night before I went to sleep [during the 2006 elections] I would count the races that we had to win. I don’t know who counts sheep, but I count Congressional districts and I could tell you without any hesitation that I would have had many a sleepless night if I had known how many women would lose among our candidates. I had them definitely making us a majority. I was counting for the majority plus five–and then of course I wanted more. But as long as I knew these were in the bank–and I really thought, we probably had ten more women, top notch candidates well spoken messengers, deeply funded to the hip–my goal was to increase the number of women here. And they were going to make us the majority. But what we then saw was the attack mail that went at it, against them and the rest. In that election, times go by and things change, but in that race, almost two years ago, the issue was immigration. It was a big issue. It was an issue where the charges against the men did not take the way they did against the women. The attacks were that women would be for giving benefits to illegal immigrants in our country–children, you know the rest of it. If you looked at Tammy Duckworth, one of the women running that year, she probably had a stack this high with a mailer that went out boom, boom, boom on this issue and same applied to many of the other women. The immigration issue stuck with the women much more than it stuck with the men. This cycle, what the Republicans are doing in our marginal districts with my new members is that they’ve coined a message, a phrase. They say, Joe Smith, whoever the person’s name–this candidate, this member of Congress is going to vote for Nancy Pelosi for speaker. Nancy Pelosi’s platform is to raise your taxes and use it for benefits for illegal aliens, raise taxes, benefit illegal immigrants. So you got immigrants, you got benefits, you got taxes. In one sentence they’ve captured all of the scare tactics. And they say this–if you make $30,000 a year, Nancy Pelosi is going to raise your taxes and use that money for benefits for illegal immigrants. They’re still doing that message. That’s still out there. But again, most people want to know what’s the difference between the two candidates running in the district. They don’t want to know about Nancy Pelosi, that hasn’t worked in any place yet, but they’re trying to make it stick. They have another thing that goes out now, somebody showed it to me. It looks just like a personal letter, so you don’t know it’s a pitch or something like that. And then on the front envelope like a big bold, black quarter-inch wide print it says, “Nancy Pelosi wants you to die.” I mean it’s frightening. “Nancy Pelosi wants you to die”! The person who showed this message to me–I think she’s from Florida…she came up to me in the van and handed it to me. “Nancy Pelosi wants you to die.” I mean imagine you get a letter or a flyer that uses the word die. I mean that’s frightening. Then you open it and it says, “that’ll be an estate tax.” And it says send this back to John Boehner [the GOP House leader.] It just shows you how bankrupt they are. We want to go out there with a positive message and an economic agenda. A jobs initiative for the future. 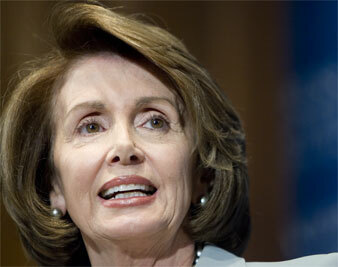 What do they have, “Nancy Pelosi wants you to die.” She wants to raise your taxes…which is all, of course, wrong. We want to cut taxes for them; raise taxes at the high end. If there’s a workable majority in Congress, what are three priority pieces of legislation? Where do you see Iraq? Oh, I thought you were talking domestic. In the past two years, we sent to the Senate–probably five times–a timeline. Say what anybody will, right to left, everybody was with us and we maybe lost a handful on the right and a handful on the left in the House, but there was no impediment to our sending them over, and over again, a time certain. But over and over again there has been an attempt on our side to bring forth a timeline for the redeployment of our troops in Iraq. We absolutely must do it. Let’s be hawkish for a moment. Let’s just say–and we all do recognize this–our first responsibility is to keep the American people safe; in their homes, their neighborhoods, their communities–safe in the world. And this war is undermining our capability to protect the American people wherever their interests are threatened. The war is not making us safer, it’s not making the region more stable, and, again, it’s undermining our military capability. The redeployment has to take place. And I think we’ll have to do some things concurrently. We won’t just do one thing and then another. But I think the signal has to be very clear that there’s a new Commander in Chief and he has always been clear about a definite redeployment on a timeline. Have you talked to Barack Obama about vice-presidential picks? The two [vetters] came in the first day–Caroline [Kennedy] was away. They had people on their list who were senators, people who were governors, people who used to be senators, people who used to be governors, people who were never elected officials. And I said to them, quietly, nicely, you know, you’re going around betting on the House, you should at least put a House member in the mix. Give me a hat and give me a hundred pieces of paper and I’ll put a hundred names in the hat and any one of them that I pull out of that group will make a great Vice President. But I’m going to make it easy for you, I told them. Chet Edwards. He is the most remarkable, most respected member of Congress. Lynn Woolsey [co-chair of the Congressional Progressive Caucus] said to me the other day, I’ve been calling him President Edwards for ten years now. He is so well-liked across the spectrum. He commands the respect of all the veterans groups to the extent that no one could match him. He put through the biggest increase in veterans’ benefits in seventy-seven years as soon as we came into power. That was the dream and that’s what we did. And he has been a leader on the Preparations Committee on issues that relate to military families and their well-being and the Military Construction Sector which he now chairs –and is now called Military Quality of Life, I think. Then he ‘s also been a leader on issues that relate to stopping the proliferation of weapons… non-nuclear issues… He has strong security credentials and he represents Waco, Texas, proper Texas. He’s a big, big church-state separation guy. He’s courageous. I mean, coming from there he’s pro-choice… he’s absolutely fabulous. Out of every name that I’ve heard, I think he’s fabulous. No lack of respect for any names they had. Anybody that Obama wants, is OK with me. Do you believe that if Obama selects a woman as his Vice-President–and it’s not Hillary Clinton–that women will view that as disrespectful? I don’t think we should be getting into that. I think Hilary Clinton ran to win. I don’t think she ran to block any other woman from having an opportunity. I really don’t think so. But there are some women saying, it has to be Hillary. Well, maybe. That would be fine too. But when we didn’t know who was going to be the nominee, I said it’s up to each of you. We’re going to have the first woman presidential nominee and she should select her Vice President; we’re going to have the first African-American, he should select his. [As to another woman Vice-President,] it certainly would depend on who it is and how she is presented. There certainly are a lot of qualified women. But I don’t think it’s going to be that way. I think if it’s going to be a woman it will be Hilary. On balancing politics and staying true to values… If the book’s subtitle is A Message to America’s Daughters, what is your message to those daughters who will ask what our representatives did to hold this President and Administration accountable for grave abuses of power? By not allowing impeachment “on the table,” aren’t you failing to protect democracy and the rule of law for future generations of our children and grandchildren? Let me say it to you this way, because most people are very emotionally involved in this issue and this President, as I said, is a total failure. He’s not a leader. He has no judgment, he has no knowledge, he has no plan. I’ve been saying that for a year. Here’s the thing. This is how I see it as Nancy Pelosi, not in my role as Speaker… why I ran for leadership and the rest. I was not setting out to win for two years. I did not want there to be any doubt in anybody’s mind that this is going to be a long standing, get used to it, strong Democratic majority. So, in my head ’06 was first, and then in ’08 we strengthen and increase, In 2010, there’s a little ebbing–assuming we have a Democratic President–and that’s not traditionally been a big year. So we hold our own. So, 2006, we win. 2008 we grow and strengthen, and in 2010 we sustain and in 2012 with a new map: it’s a whole new world. This map, we can only go so far with this map…redistricting…we need a whole new map. What we’re talking about is only the next presidential election. So my view in politics is deeply rooted in how I was raised in politics: It’s all about economics. One of the reasons I decided to run for leadership is I thought it was absolutely urgent that we win. We see a situation where we have an economy where they are sucking the money out of the middle class. One percent of the people in this country control almost a quarter of the wealth…and it’s at the expense of the middle class. We want to reward success and achievement, entrepreneurial spirit and the rest of that. But this is not what a democracy is about. So my whole thing was always about the middle class being this backbone of a democracy and I saw what was happening here was with the President and the Republican Congress a complete disregard–worse than that–for working families in our country. So I come into this picture with, they have to know we’re here to stay, plus we have to have a predictable future. And I said before the election that impeachment was off the table. Now that means, in the set of facts that we know now the fact of the matter is that in order to impeach the President, you must have the information. Also, the fact of the matter is you don’t get any information from these people. The further fact of this is that because of the judges that they appointed, we couldn’t get any information about Cheney. So what is the risk-benefit of going down that route rather than saying we want to bring the country together so that we could win and continue to win and elect a Democratic President–absolutely essential–and change the economics of America? This is going to be a caste system and I carry that burden as well as some more and the rest of it. I carry that responsibility. So my view of it is what is in the interest of unifying the country which–we have a responsibility to do, but to do so in a way that has a progressive economic agenda. And other people just see it as if we want it, we do this then we’re going to win–well, I’m not sure. I have my own–what’s the word I usually use about this–grievances about Democrats who voted for this war. We had a word that there was no intelligence to support an imminent threat to the United States. There was nothing. But when I was running to be Speaker they said, if you go against this war you will never go any place in this party. You’re probably one of thirty-five people going against this war. I told them, I may be the only one but I won’t be voting for this war. I had to oppose many Democrats, including the whip. That was a big deal. And also the Senate voted the wrong way–voted to give him the authority to go to war and use that power when there was absolutely nothing in the intelligence to support the imminent threat that the Administration was claiming…You’ve heard me say this before…when I said that at the time, they said you’re calling the President a liar…I said I’m stating a fact. As it turns out, everybody knew that he didn’t have…and now everyone’s blaming it on the faulty intelligence. It wasn’t there. So in terms of why should he be impeached? Because he took us to war? Well what about these other people who voted for that war with no evidence to tell them that this war? Are they going to be voting with us to impeach the President? Where are these Democrats going to be? Are they going to be voting for us to impeach a President who took us to war on information that they had also? No, no–we have to hold the President accountable and we have had more hearings on accountability. We’ve set a record. But Mr. Waxman has and others, I think, have established a record in the past eighteen months to build whatever we’re going to do next time. There is a record of what they have done in terms of squandering our money. The whole thing. How do you foresee that record being used? I think that once we have a new President we can get more information because I think the country deserves the right to know. But we’ll never get the goods on Bush to impeach him until we get the votes from the people who voted for the war, overwhelmingly, and what does that do to the country in light of the fact that the Republicans would have liked nothing better. You know who wanted us to impeach the President…it was the Republicans. All of that takes the attention away from what is the issue. They are sucking the money out of the middle class to the advantage of the wealthiest people in our country and they would like nobody to be paying attention to that. You want to go impeach the President, you want to do that…because it’s all about money for them…the money their friends made on this war…the money their friends made getting us to four dollars a gallon at the pump…the transfer of wealth. So put me down as a very liberal progressive economic Democrat. We’re here. I’ll take the barbs, but I’ve got to keep us on course so that we can be a strong, assured, assumed-to-them, Democratic majority–so we can do what we have to do: healthcare, education, fairness and prosperity and let people participate in the prosperity of our country. It’s only a decision and every decision has been made against working families in America and the leverage has been with the wealthy. I mean, these people at Fannie Mae and Freddie Mac, they’ve joined the Wal-Mart club. That is to say, these people make in two weeks even more what it takes a minimum wage earner working full-time for his entire life. Something is very wrong. But can a Democratic Congress take measures bold enough to meet the economic challenges we face? We have to. We have to get in front of it with a strong economic agenda that has fairness in it. We have ideas about that. It’s also about a President. So when you talk about sixty votes in the Senate, one of the reasons the sixty-vote barrier is there is because they’re guarding the gate of the President’s desk. They don’t want the President to have to veto this or that bill. Who in the world knows that the House passed this and it went to the Senate and it didn’t get sixty votes? Nobody knows. If you get it on the President’s desk and he vetoes it, the world knows. That’s what they do–they diminish the exposure some of this gets. So, when we have a Democratic President and some of those Republicans no longer have to guard him or return a favor…You have to give [Bush] credit–on the war, on SChip, on biomedical and stem cell research, he has kept them in the fold. They have voted with him right down the line. I don’t want to say “credit”–how on earth could they vote with him on these issues that are so important to the American people? I think once we have a Democratic President, they’ll have to search hard and long for some Republicans who will want to stand in the way of progress. And you have a bully pulpit. There is nothing like a presidential bully pulpit. There’s been a die-in on Sunday off and on for the past five months, six months by now. Mostly, they’ve been there every day, but now it comes and goes. But they had about fifty people at the die-in. And what happens is they put it on the Internet, “come to Nancy Pelosi’s house she’s having tea for us”…and they get all kinds of people that they can’t even answer for. It’s not a safe thing. But anyway, I’m from the grassroots, I’m an activist myself so I respect that. But the impeachment…what are the facts, what is the reality and what can we pass, remembering that Democrats voted for that? What is the opportunity we have to get the information? What is the point if we’re not going to win–in terms of instead saying, I am keeping my eye on the ball so that we win! Now it’s not about politics, it’s about policy. It’s not just about winning. It’s about winning for the purpose of setting this country right…this is like a hundred years ago…the Gilded Age and everything that went with that in terms of unfairness to working families. I think there is that much at risk. As far back as February 2007, the Financial Services Committee organized and then two months later we passed the GSE Reform Bill. We had a bill on the floor and we passed it . Nothing happens for all this time. We try to get some of it in the stimulus package. The Administration resisted. You know how long it is to get anything done in the Senate. And so now we’re passing it in July–a full fifteen months after we passed it in the beginning of our term. We anticipated that there was a need for a reform–though it got worse. We had great minds at work and intellectual resources to call upon and the responsibility is on us to get these things, to get this job done. But the most important thing, and this is the linchpin between the two issues, we will never change the policy in Washington until we change how Washington works. (She bangs, gently, on the table.) And that’s why Obama’s ethics reform is essential. You know, I was neutral in the race. I love Hillary, I liked all ten of them (laughs)…but they came down to the two. I was happy as I could be with either one of them. The fact is it is Obama, and the fact is he has nothing to do with the past here. He passed this legislation, we had to work hard to get the members, kicking and screaming, to vote for it. It was uncertainty to them–that there was a going to be a bright light shone on contributions and who collected them and all that. Now it’s not perfect, for sure, but it takes us down the road. I see it is as crucial and while I’m Speaker of the House, I come to this role as an outsider. I came because I did not like what I saw. Not that I thought that there was any corruption on the Democratic side. I did not. I knew that there was heavy-duty corruption on the Republican side and that we had to defeat them. And that’s why I said I’m not going to run just to win once, I have a plan for how we’re going to change the country by having bigger, stronger, more confident, predictable Democratic majorities and help elect a Democratic President. But you can’t get it done because the powers that be here told me you will never pass an energy bill. The day I was bringing it to the floor, they kept pushing the sign for one reason or the other…. And the day I was bringing it to the floor, my friends and colleagues came to me and said, K Street said you can’t win, you’re going to be humiliated. I said no, I am going to win. I don’t have any thought of not bringing this bill to the floor. Win or lose, we’re putting people on record–they’re either with the future or with the past or with the special interests or with the people’s interests. And we won big. And we had to fight with some people in the Democratic Party on that. Not because they were associated with the big interests but because they were from coal country or from this country or that country. But anyway, whether you’re talking about healthcare, whether you’re talking about energy, whether you’re talking about one of the bills that we’re trying to bring up next week, the Pay Equity; the Chamber of Congress–imagine, the Chamber of Congress putting out letters against pay equity! With that change, with the spotlight there, we can make a bigger difference because these people make a living promoting the status quo. They’re about yesterday, they’re not about tomorrow. We have to respect industries in our country, but they cannot call the shots about what we’re going to do about global warming, about health care, about fairness in our economy. That has to be independent of them.